This animation shows the Andromeda galaxy, first as seen in visible light by the National Optical Astronomy Observatory, then as seen in infrared by NASA's Spitzer Space Telescope. The visible-light image highlights the galaxy's population of about one trillion stars. The stars are so crammed into its core that this region blazes with bright starlight. In contrast, the false-colored Spitzer view reveals red waves of dust against a more tranquil sea of blue stars. The dust lanes can be seen twirling all the way into the galaxy's center. This dust is warmed by young stars and shines at infrared wavelengths, which are represented in red. The blue color signifies shorter-wavelength infrared light primarily from older stars. 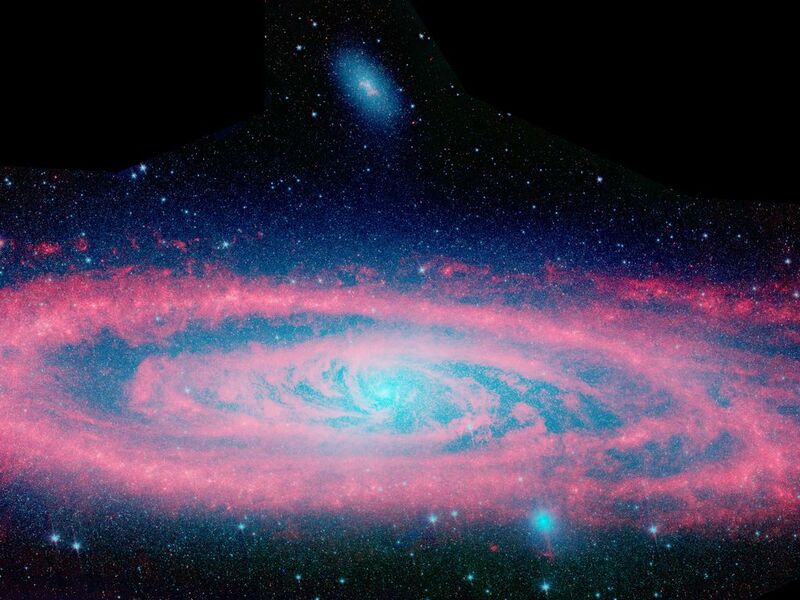 The Andromeda galaxy, also known affectionately by astronomers as Messier 31, is located 2.5 million light-years away in the constellation Andromeda. It is the closest major galaxy to the Milky Way, making it the ideal specimen for carefully examining the nature of galaxies. On a clear, dark night, the galaxy can be spotted with the naked eye as a fuzzy blob. Andromeda's entire disk spans about 260,000 light-years, which means that a light beam would take 260,000 years to travel from one end of the galaxy to the other. By comparison, the Milky Way is about 100,000 light-years across. 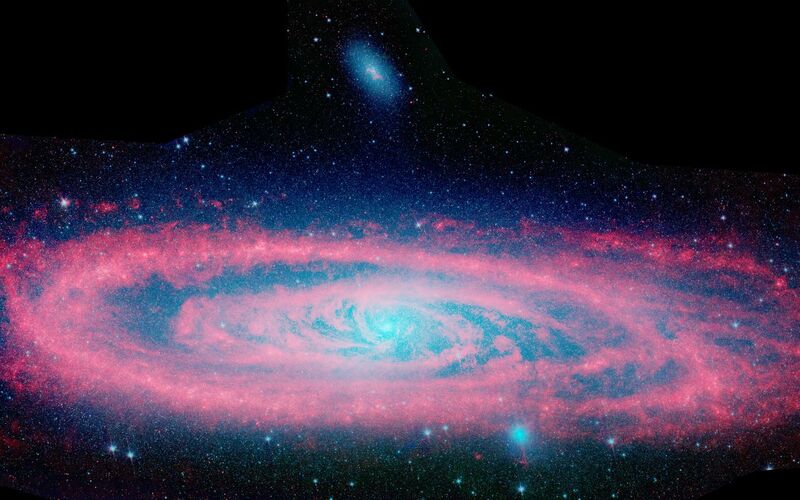 When viewed from Earth, Andromeda occupies a portion of the sky equivalent to seven full moons. 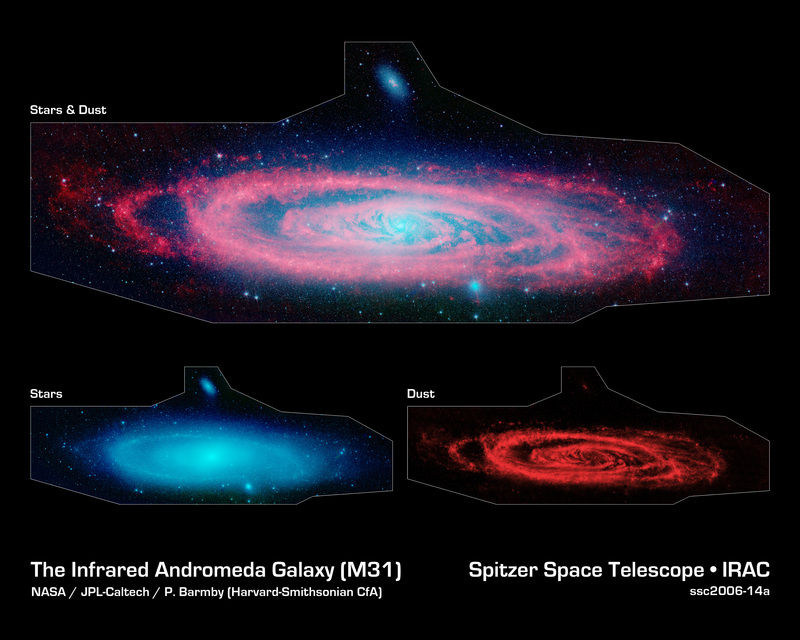 Because this galaxy is so large, the infrared images had to be stitched together out of about 3,000 separate Spitzer exposures. The light detected by Spitzer's infrared array camera at 3.6 and 4.5 microns is sensitive mostly to starlight and is shown in blue and green, respectively. The 8-micron light shows warm dust and is shown in red. The contribution from starlight has been subtracted from the 8-micron image to better highlight the dust structures. Note: The size of the Full-Res TIFF for the still image is 14772 samples x 4953 lines.